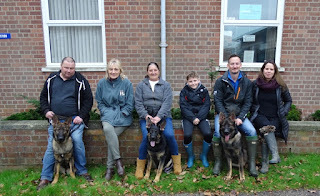 The 2018 Dorset, Devon and Cornwall Alliance Police dog Assessments took place in Exeter from Monday 11th Feb 2019 to Wednesday 13th Feb 2019, to select the top 3 teams to represent the Alliance at the forthcoming Regional Police dog assessments being hosted by Avon and Somerset Police in April 2019. I was very grateful to the organiser Sgt James Little from Cornwall for inviting me to Judge the assessments. As the Canine development officer it is my responsibility to acquire all of our pups and develop them with their puppy walkers. I also bred PD Ash and PD Comet and so to see them all performing was a huge thrill for me. The following teams took part. PC Steve Cruwys and PD Lenny are stationed at Exeter. Steve is an experienced handler and PD Lenny who was born on 23/4/15 was imported from Germany aged 15 weeks and was puppy walked by myself. 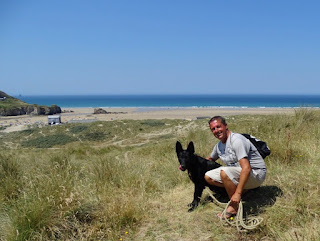 PC Lee Adamson and PD Grommitt are stationed in North Devon. 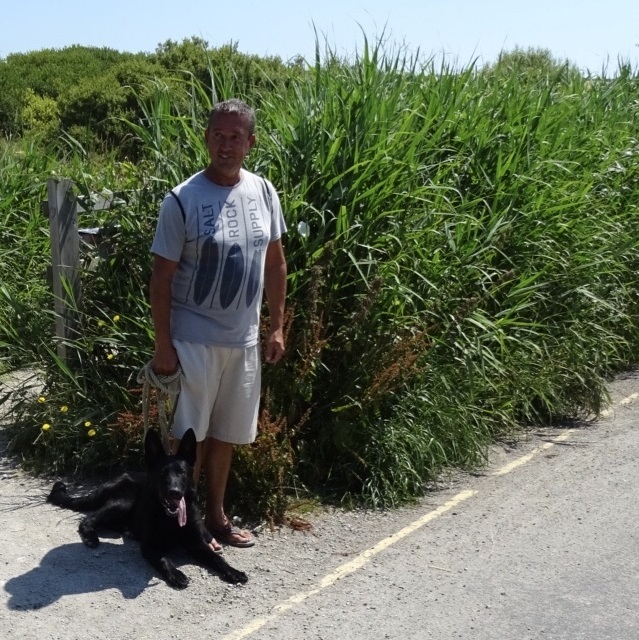 Lee is an experienced handler and PD Grommit who was born on the 16/6/13 came through our puppy program and was puppy walked by Phil and Mel Rooks in Plymouth. He was originally handled by retired Police dog Sergeant Alan Knight but Lee re-handled him several years ago when Alan retired. PC Luke Barnard and PD Jacque are stationed in Ashburton. Luke is a first time handler and Jacque who was born on the 23/5/15 was donated to the force as a young puppy by Diane Oldfield in Cornwall. Diane’s late husband former Devon and Cornwall Police officer Peter Oldfield died shortly after purchasing Jacque. Diane realised that Jacque needed an outlet for his energetic character and offered him to Devon and Cornwall Police. 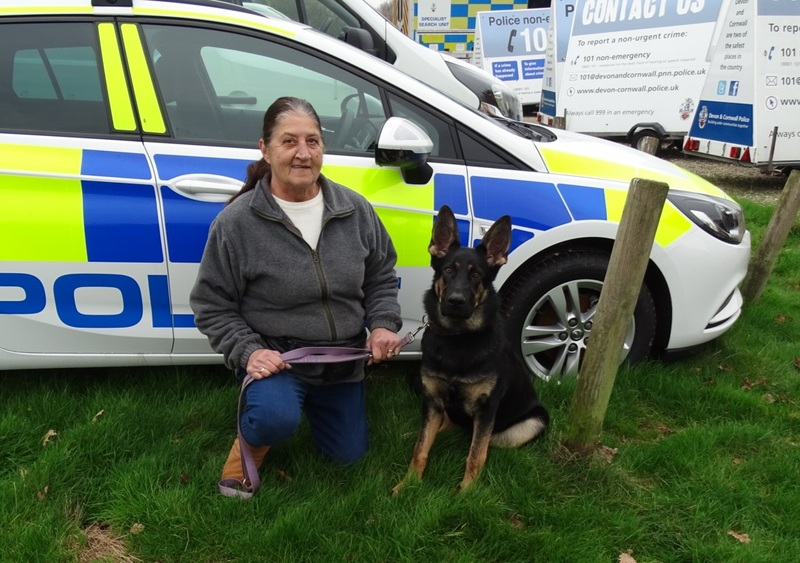 She knew that her husband would have been happy because he was a good friend of the late and legendary Devon and Cornwall Police dog handler Jack Rule. Jacque was puppy walked by Heather Iles in Newquay. PC Andy Ronayne and PD Nato are stationed at Plymouth. 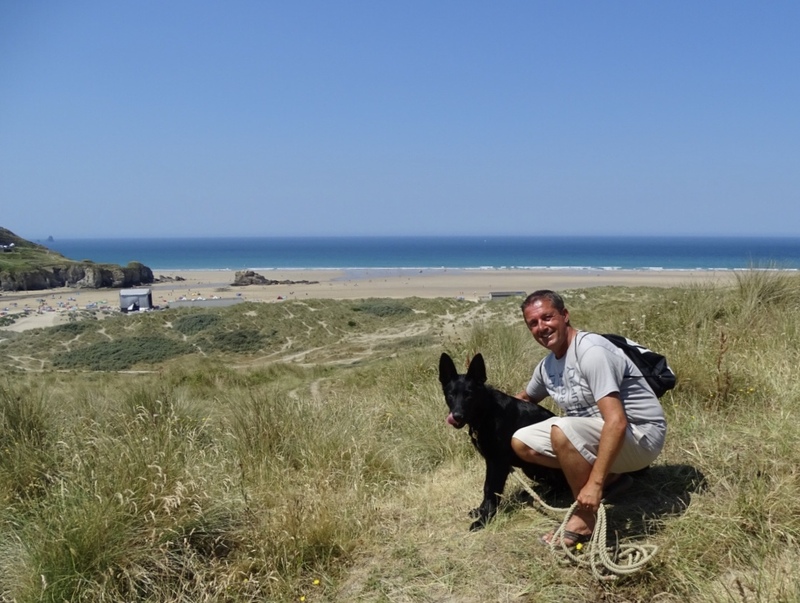 Andy is an experienced handler and Nato who was born on 14/7/15 was puppy walked by Susannah Coffin in North Devon. PC Jason Gilbert and PD Comet are stationed at Camborne. 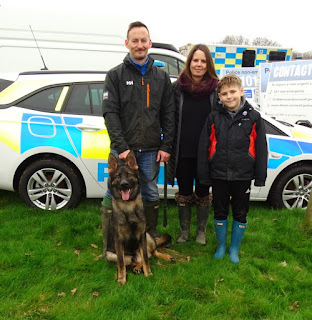 Jason is an experienced handler and Comet who was bred by the force was born on the 20th October 2015 and was puppy walked by Dawn Harrison in Plymouth. PC Ben Jobes and PD Ash are stationed at Camborne. Ben is a first time handler and Ash who was bred by the force was born on the 3rd of June 2013 and was puppy walked by Annie Miller in Cornwall. Ben & PD Ash won the Force and Regional Police dog trials ( Assessments) last year and were highly placed at the National Police dog trials. The Assessments are held annually and assess all of the required skills necessary to be a successful Police dog team. The top 3 teams go on to the Regional Police dog assessments and the top Regional Police dog teams then go on to the National Police dog assessments. The teams are assessed on their ability to track and search for outstanding criminals, vulnerable missing persons or outstanding missing or stolen property. They are also assessed on their ability to deal with violent criminals, volatile crowds, agility and general control. In Phase 1 the teams are assessed on their tracking and property searching skills. Each team is given an area where 90 minutes earlier the track layer (criminal) has walked a half mile trail with multiple changes of direction and has hidden 4 small items along the route. The competitors are assessed on how accurately they follow the trail and how many hidden articles that they locate. Once they reach the end of the track they then have to deal with the criminal they have been tracking. Here is Steve and Lenny hot on the offender’s trail. Here is Luke and PD Jacque on the trail. Here is Jacque having located an article hidden in the grass and signals to his handler he has found the item by lying down next to it. To get maximum marks the dog should indicate passively and not touch the article. Having completed the track and located the criminal the handler attempts to detain the criminal who then runs away to evade capture. The handler must send his/her dog to detain the criminal. ( Here is Ben sending PD Ash after the criminal. When the criminal sees the dog approaching he/she will suddenly surrender and stop running. The dog should not bite but should instead bark and maintain surveillance until joined by his/her handler. Here is PD Grommitt having chased the criminal is keeping surveillance on the criminal preventing his escape and awaiting for his handler Lee to join him. The handler will then interrogate the criminal while his/her dog maintains observations in a controlled position. If the criminal attempts to attack the handler or run the dog will immediately detain the criminal. After securing and detained the criminal the team then have to search another area to locate 4 further articles or items of property which have been hidden. Here is Comet telling his handler he has found an article. The handler Jason then has to signal to the Judge that his dog has located an article and then the handler has to recover the article before continuing with the search. Here is Andy just about to take possession of an article located by Nato. Ben and PD Ash were the winners of Phase 1 and they hardly dropped any marks on the track, property search or the stand -off. My favourite memory of the day was Jason and Comet. There is a time limit to complete the phase and the competitors are racing against the clock. Comet lost his way on the track and as a result had to work much harder than anyone else to recover the situation. Comet became tired. Time was running out but Jason realising his dog was tired stopped and gave his dog a long rest before continuing which for me is the mark of a top dog handler always putting his/her dog first. I was very impressed with the performance of the teams but I wasn’t surprised because this group of dogs are all achieving excellent operational tracking results. Day 2 the teams had to demonstrate their ability to search and locate 2 outstanding criminals and also during the search to deal with an unexpected attack on the handler by an armed criminal. The search area consisted of 2 large buildings, an open area with numerous caravans, a yard and a smaller building. Depending on the scenario the teams are either searching for Criminals or Vulnerable missing persons. In this scenario the teams were searching for criminals. One criminal was hidden and inaccessible and the other criminal was open and accessible. Here is Grommit locating the accessible criminal by barking to alert his handler he has found someone. Here is Lee making it very clear that if the criminal doesn’t do as he is told Grommit will be introduced into the equation. Provided the criminal offers no violence or attempts to run away the dog will bark to alert his/her handler that he/she has found someone. Lenny here has located his man and he is making it quite clear behave or else. I was unable to take any photo’s of the hidden criminal due to him being inside a closed cupboard in a room where there was only room for the dog handler and dog. Here is Jason having just issued a challenge that anyone hiding in the area should give themselves up otherwise he will send his dog Comet in to search for them. At the conclusion of the search each dog team had to deal with a very hostile attack which tested the boldness of each dog. All of the dogs responded with a strong bold attack and showed no nerves or avoidance whatsoever. Here are Nato and Jacque dealing with their criminals. The teams are assessed on their search technique, the ability the handler has to move and control their dog, thoroughness of the search, the strength of the dogs indications and safe indications if the criminal is passive. Here is Ben searching the criminal with PD Ash. The standard of the searches, the all-round level of control and the boldness of the dogs on the attack exercise was first class. The fact that only 11 marks separated the 6 competitors was evidence of that. Phase 3 assesses the ability of the handler and dog to deal with use of force scenario’s, their general control and agility skills. The majority of the marks are in this phase. There are 5 Use of force exercises. 1. The Chase and attack. 2. The Stand-off. 3. The Emergency recall. 4. The weapon attack. 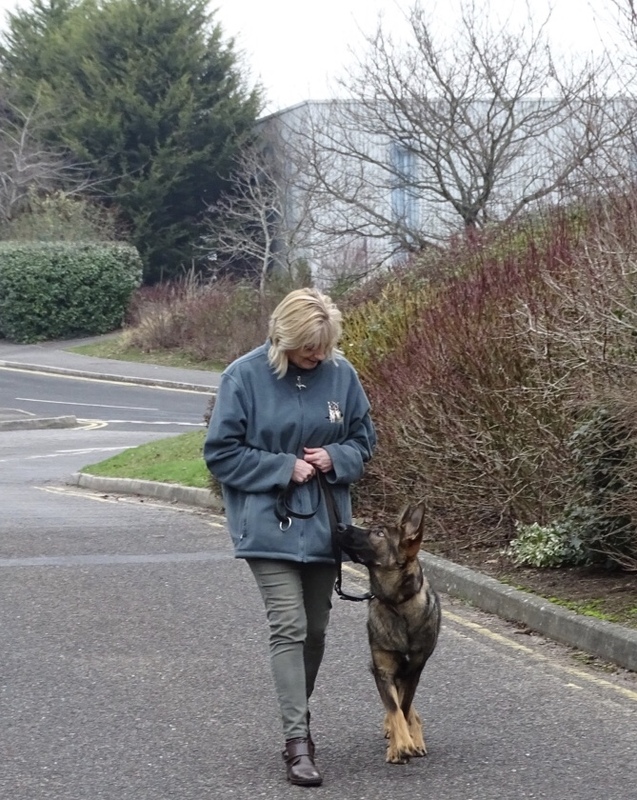 They also are assessed on their heelwork, agility and the send-away exercise. The send-away is an exercise where the handler has to send his dog to a point at least 100 metres away and then has to re-direct the dog to another point left or right and then recall the dog. Here is Luke setting Jacque up to send him to a point 100 metres away. This is an exercise that takes a lot of time and effort spent training together to achieve. It was obvious to me that Luke has put in a lot of work and has done a fantastic job with Jacque. I’m sure that if Jacques late owner Peter and his friend Dog handler Jack Rule were looking down they would have both been very proud of Luke and Jacque. A Police dog must at all times be under the complete control of the handler and so a lot of work goes into control exercises such as heelwork, the stay positions the recall, agility, and releasing a detained criminal on command. All the handlers achieve good standards in training but demonstrating this in competition conditions with the public and peers looking on is a lot harder. Here are some more photos of the handlers competing in this phase. Lee and PD Grommit demonstrating some very tidy heelwork. PD Comet negotiating the hurdle. Jason needed to tell PD Comet that this was the long jump and not the high jump. Ben and a very attentive PD Ash receiving their instructions from the Steward James. PD Ash not needing a second invitation to tackle the gun criminal. On the straight chase exercise the dog should remain in a stationary position alongside the handler and should not give chase until told to do so. Andy has perfect control here over Nato but once Andy gave the order to detain the criminal Nato’s long legs made sure there was no escape. PD Jacque making light work of negotiating the 6 foot scale but like all good handlers Luke is ready to give him a lift up if needed or to stop him falling back. The weapon attack is a test of courage and Grommitt demonstrates here that he is certainly not lacking in that department. I made the tests a little harder than normal by having the straight chase first and then immediately afterwards the Stand-off. The two exercises are identical in that both involve a fleeing criminal but on the stand-off the criminal suddenly stops running and gives himself up and the dog must not bite. Here is PD Ash doing the straight chase and immediately afterwards successfully standing out on the stand-off. 3 out of the 6 teams successfully performed the stand-off exercise Comet, Ash and Grommit. 4 out of 6 teams successfully completed the emergency recall Comet, Ash, Grommit and Nato. The emergency recall is probably the most important exercise of them all. The criminal runs and the dog is sent to chase and detain him. Once the dog gets 40 metres into the chase the handler must demonstrate he/she has the ability to terminate the chase by calling the dog back to him/her. Here is Grommit successfully recalling from the chase. This exercise could save the dog’s life if he/she is chasing a fleeing criminal who runs towards a busy main road. A very successful Phase 3 rounded off an excellent 3 days of assessments. We were very grateful to our Superintendent from Operations Nicky Leaper who is a big supporter of the dog unit for presenting the awards. Overall Third place went to Andy and PD Nato and the award for winning Phase 2 the search trophy. Overall Second place went to Lee Adamson and PD Grommit and also the award for winning the Phase 3 trophy. It was also a proud moment for retired Police dog Sgt Alan Knight who was Grommit’s handler at the start of Grommit’s career. When Alan retired Grommit was re-handled by Lee who no doubt benefited from the excellent foundations that Alan had put in. Lee has since taken Grommit onto another level. Annie Miller one of our experienced puppy walkers donated the runner up trophy and sent her apologies at not being able to attend the assessments. The overall winner’s trophy went to Ben Jobes and PD Ash who are the current holders of the trophy. They also won the Tracking trophy and the Phase 1 Trophy. The 3 winners will now go on to represent the Alliance at the Regional Police dog assessments being held in Avon and Somerset in April. From left to right are Lee Adamson with Grommit, Ben Jobes with Ash and Andy Ronayne with Nato. To clarify the scores I would like to mention Steve and Lenny. They have only been together for just over 12 months. They performed well on phases 1 & 2 but on phase 3 Lenny’s hyper alertness and the excitement and nerves of the day no doubt got the better of him causing me to withdraw him. I thought that Steve managed the situation extremely well and whilst it may have been a bit soon for Lenny to handle a Phase 3 under competition conditions I have no doubt Steve will work with Lenny to rectify that. Regardless of the results I would like to thank all of the handlers for their hard work, professionalism and particularly for showing the character and resolve needed to take part in assessments with their dogs. I would like to congratulate the handlers for the patience and compassion that they all showed towards their dogs. Congratulations should also go to the environmental trainers Phil Wilson and Tim Goodwin for the help I know they give to the handlers. I wish the teams the best of luck in the Regional Assessments. From left to right are Errol, Ernie and Echo from our E litter who were born on the 23/2/18. These pups are being developed for our September 2019 General purpose Initial Police dog course. We started with 5 pups from our E litter which included Eddie and Eyke. We released Eddie just before Xmas having decided that being a Police dog was probably not the life for Eddie. If a pup has to be released from our program we always offer first refusal to our puppy walkers at no cost if they wish to keep their pup. Puppy walkers Alaina and Ryan were disappointed that he didn’t progress but were delighted to keep him. Eyke was the other member of the original 5 and I am very happy to report that because of an unexpected vacancy on the January 2019 Initial Police dog course Eyke was fast tracked onto the course and is now in week 4 of the 13 week long course. Errol is pictured here with puppy walkers Sue and Andy. Errol is a very steady performer and although he hasn’t always been the boldest in the group he has really come on in the last few months. Here he is practising his stays with puppy walker Andy. As a puppy Errol was always the food monster and that hasn’t changed. It has been a simple task getting Errol to track with a real intensity using food drops. He is going to be an excellent tracking dog. Ernie pictured here with puppy walker Dave didn’t have the best start in life because through no fault of his he had 3 different puppy walkers. Dave and Viv are his current puppy walkers and have given him the stability that all pups need. Just like his brother Eyke he is a bit of a tough nut and definitely a challenge but I think he will relish the work of a Police dog and will be devoted to his handler. This is a video of him undergoing his boldness assessment. A Police dog has to be able to deal with all sorts of unnerving experiences without panicking. This was a perfect reaction for such a young dog. Echo pictured here with puppy walkers Michelle and Paul is a pocket rocket. What she lacks in size she more than makes up with her tenacity, determination and her feisty character. Just like her brothers she is also going to be an excellent tracking dog which is the main skill and attribute required by our dog handlers. Errol, Ernie and Echo are all environmentally confident and are doing extremely well on all of their training exercises. Considering they still have over 6 months to go before their Initial Police dog course they will be starting at an exceptional level. These 3 pups are also earmarked for our September 2019 Initial Police dog course. We also have 2 more of Bernard’s dogs in our youngest group Jay and Arnie. I am a real fan of the pups we have had from Bernard because they do seem to have that quiet confidence, calmness, balanced temperament, willingness and sensible drive so hard to find in German shepherds these days. Here is Nero watching Mary Poppins. Unfortunately the modern German shepherd is beset with every conceivable health problem which together with their tendency to be wildly over excitable means that service dog trainers are having to rely more and more on alternative breeds such as the Malinois and Dutch herder. Nico is pictured here with first time puppy walkers Karen and Rod who live in Bampton. They have put a lot of time and effort into Nico as do all of our puppy walkers. Here is Karen (centre) working on his down stay exercise and his heelwork. He is becoming a very powerful dog now and just as we have to do with a lot of the pups when they get to 6 to 7 months we have started to train him to walk on a figure of 8 head collar. All of his exercises ie tracking, puppy bite-work, searching, and control work are excellent. Here is Nico on his first puppy bite-work session with Rod. Nicki is pictured here with puppy walker Margaret who has puppy walked several puppies for the force and regularly helps out with short term placements when puppy walkers go on holiday or short breaks. Margaret lives alone and so doesn’t have anyone to help with training in between our fortnightly development sessions. She has still managed to get Nicky up to a very good level and particularly with her tracking. Unfortunately Margaret recently fell off a step ladder while clearing the overflow on her garage and badly dislocated her shoulder. Sadly Margaret isn’t going to be able to continue puppy walking Nicki but hopes that she will be able to continue looking after the smaller pups when walkers go on holiday. Nicki is a very nice natured puppy who is a pleasure to own and just loves meeting people. But when it comes to tenacity and attitude she is certainly not going to be a soft touch. She can be very assertive when she needs to be as I found out on our very first puppy bite-work session. I would like to thank my part time helpers Steve Pearce and Mary Downs who always help me out at short notice and looked after Nicki while I found a new home for her after Margaret’s unfortunate accident. 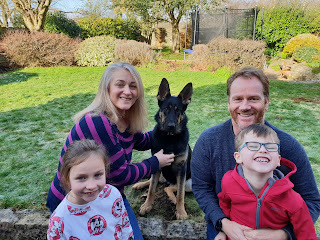 Nicki has gone to new puppy walkers Sara, Simon and children Issi and Marc in Exeter and has settled in very well indeed. It wasn’t the ideal start because Nicki came into season on the day she joined her new puppy walking family. Nero is pictured here with puppy walkers Chris, Lindsay and Henry. Just like his siblings Nero has excellent working qualities and particularly with regard to his natural tracking potential. Tracking or trailing after a criminal fleeing a crime scene or a vulnerable missing person make up a large percentage of a dog handlers work. For this reason I have recently concentrated on teaching our puppy walkers how to lay and run their own tracks so that they can practise this skill between our fortnightly training sessions. If you can get this exercise ingrained into the puppy from an early age it can greatly assist in developing them into an exceptional operational tracking dog. Here is a video of Chris and Nero tracking. Nico, Nero And Nicki are pictured here on our last training day. These are our youngest group of pups pictured on Sunday on our visit to Saundercroft farm. They are earmarked for our January 2020 Initial Police dog course. From left to right are Rana, Jay, Ginny, Arnie, Rebel and Rogue. All of the pups were very confident, calm and sensible meeting all of the various animals. 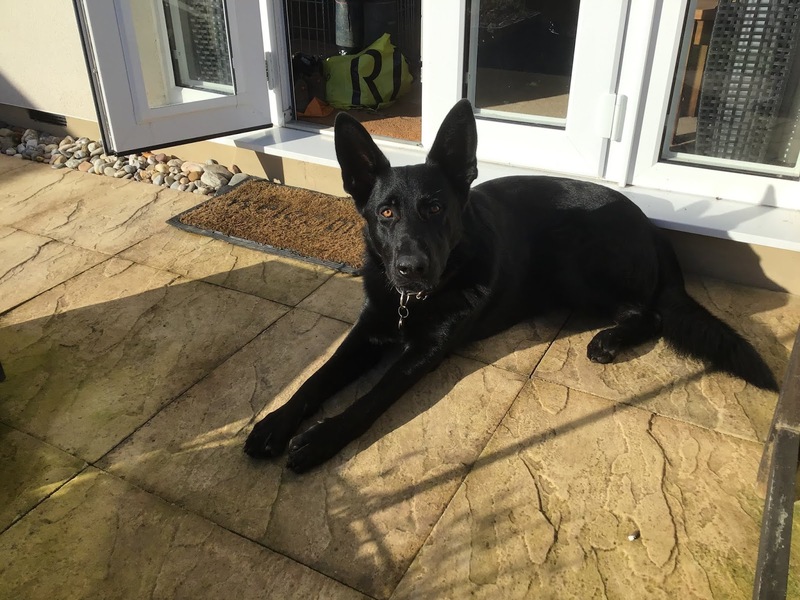 Rana was a little bit vocal and reactive to start with but that was understandable because unlike all the other pups who we acquired at 8 weeks Rana arrived at 15 weeks missing out on a valuable part of her socialisation period. I imported Rana who has just turned 5 months from Belgium just before Xmas. Brothers Jay and Arnie were bred by Bernard Horton of Kazzardsway German shepherds and are also just over 5 months old. Rebel, Rogue and Ginny are brothers and sister and were supplied by Ian Morgan of Lorockmor Working dogs in Shropshire. They have just turned 6 months. Ian also provided Merlin who licensed in December 2018 and he also provided Bill and Ben who are both doing well on the current Initial Police dog course which is now in week 4. Rana is pictured with puppy walkers Colin and Mitzi who are experienced puppy walkers for the force and live in Newton Abbott. I acquired Rana because of her excellent breeding which I hope will enhance our program. She is going to be a very assertive dog which was in evidence on our farm visit where she was reacting very vocally to the animals she had obviously never seen before. Colin and Mitzi’s son Luke did some excellent work distracting her with control exercises and titbits until she became bored and more confident. Jay is pictured here with first time puppy walkers Stewart and Alison who live in Crediton. Jay is named after their son Jamie who was tragically killed on his motorbike in 2014 whilst travelling home on leave from the Royal Signals. Jay is doing Jamie proud and it is obvious to me that Jay is giving Stewart and Alison a lot of pleasure and enjoyment. He has all the characteristics that I look for in potential Police dog and just takes everything in his stride. Arnie is pictured here with first time puppy walkers Andy and his family who live in Plymouth. Arnie is very similar to his brother Jay in that he also takes everything in his stride. He is not as bold as his brother but he is a generally confident dog with good working drives and I can see the improvements in his development each time I see him. He has natural tracking ability and he is definitely a steady but determined dog who when he sets his mind to something he doesn’t give up. Here he is demonstrating those qualities whilst searching for his toy. 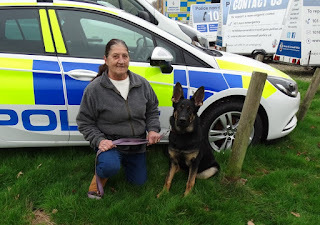 Rebel is pictured here with very experienced puppy walkers Terry and Jill who live in Exeter. Rebel was a little cautious of all the other pups when we first got him but that now seems to have disappeared and during our farm visit he was very confident with everything he encountered. He was more interested in eating sheep droppings and the cows animal feed rather than worrying about what the animals were doing. Rebel has a lovely temperament and has really strong working potential. He does have one negative in that he will chase his tail quite excessively if he gets excited or bored. It is improving but it is definitely a work in progress. Keeping him busy is the key and when he joins all of his buddies like sister Ginny there is no sign of it. 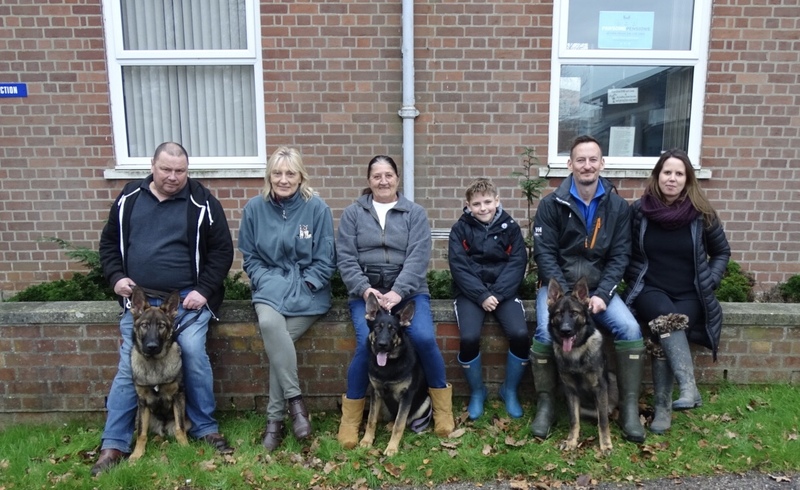 Rogue is pictured here with puppy walkers Lyn, John and Ian who live in Plymouth. Rogue is very aptly named because he is definitely not a dog who is going to be suited to a novice handler. He is a very strong willed determined dog who when Lyn first got him would instinctively attempt to guard any possession he felt was his. Fortunately our most experienced puppy walker Lyn has plenty of experience of this and the boundaries have been well and truly drawn. Rogue is a much happier dog for this but his next handler will have to earn this respect from Rogue. I was very impressed with Rogue’s sensible and calm attitude on our farm visit. However he is devoted to Lyn’s grandson Jack and because Jack was having such a great day charging around Rogue was getting agitated not at the animals but because he wanted to be with Jack. Ginny is pictured here with first time puppy walkers Marian and Keith who live in Exeter. Ginny didn’t have the best start because she had 2 puppy walkers in her first month and was a little unsettled when Marian and Keith took her. They have done a first class job socialising her and getting her out and about which was just what she needed. She is a very confident female with very high energy levels which means she is always on the go. She certainly loves her tracking exercise and just like her brothers Rebel and Rogue she is going to be an excellent tracking dog. Its very much a joint effort with Marian and Keith which makes things a bit easier with a high drive dog like Ginny. Like all the pups in the group Ginny enjoyed her day at the farm and was a credit to the puppy program. Going forward I am very pleased with all of our 12 pups. It never fails to amaze me just how much hard work and dedication our unpaid puppy walkers put into their pups. For example on our Xmas get together on December 23rd we had 13 out 14 of our puppy walkers turn up with their pups and over 50 supporters and helpers which I think is quite extraordinary. If we can keep everyone together and continue with our progress the standard of these pups starting their Initial Police dog course could be the best we have ever had. I will leave you with some video’s of our day on the farm which will give you an insight of how the day went. My thanks as always to Andi Darby, Simon, young Will and mum Jean for allowing us all to intrude on their farm and for their time, help and hospitality. Sydney is pictured above with his puppy walker and best friend Phil Ash. They have been joined at the hip since I allocated Sydney aged 15 weeks to Phil on the 4th April 2018 having brought him over from Holland. From the start he has been one of our best pups in terms of his environmental confidence, working ability and fantastic temperament. At 8 months we assessed him on all types of shiny floors, stairs, escalators and he was totally confident on all. At 12 months Sydney was allocated to his handler for the start of the 2019 January Initial Police dog course but on day 2 of the course he wouldn’t go onto certain types of floor in our training building. My instinct immediately told me it was probably this strange phenomenon that some dogs can suffer from ie a fear of going onto certain types of floor surface. For some bizarre reason it often doesn’t materialise until the dog is between 10 and 18 months. I have witnessed dozens of such cases and I took a female that I raised from a pup who developed it at 12 months to a veterinary optical specialist. He told me that they don’t know why it occurs and that it is probably genetic and develops when the brain and eye mature. We took Sydney back to his puppy walker just in case it was the stress of being parted from the one person he absolutely adored. Phil let him relax for several weeks and then came back up to Exeter. Sydney spent an hour running in the snow with my female Ella to relax him and we then took him into Exeter city centre. In Exeter he immediately refused to go on any floor with reflective light on it. I found it very emotional seeing Sydney so terrified to go onto this floor but because of this incredible bond and trust that they share together he went over to Phil. I knew immediately that this was the end of Sydney’s Police career. We cant justify the expense of a 13 week course knowing that he probably could never go on to be a dog who could work with our Tactical firearms officers searching buildings. 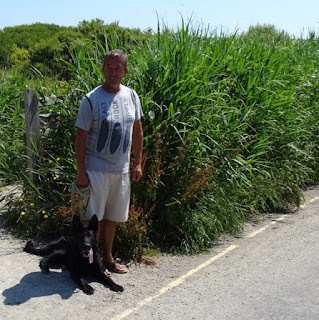 One of our Instructors in the Police dog training school Phil Wilson has done a lot of good work with dogs who have developed this problem after completing their Initial Police dog course with very good results. I didn’t need to ask if puppy walker Phil wanted to keep Sydney as I knew the answer to that one. They will carry on with their celebrity status because everyone knows Sydney in Perrenporth where they live. I wish them all the luck in the world and it has been such a pleasure knowing and working with them.